Here’s a small sampling of the dozens of auction items we’ll have at this year’s Fish Fry and Auction on October 13th. 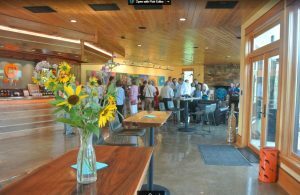 Treat yourself and a group of friends and/or family to a very special celebration at these beautiful vineyards and tasting room on the banks of the North Fork. Muse Vineyards is a family-owned and run,boutique winery in the heart of the Shenandoah Valley at Woodstock, where viticulture, science, passion and respect for the traditions of classic wine making converge to produce award-winning wines. In 2015, just a few short years after its founding, Muse’s 2009 Clio, a Bordeaux-style blend, was named Virginia’s top wine and awarded the coveted 2015 Virginia Governor’s Cup, besting some 400 entries from across the state! 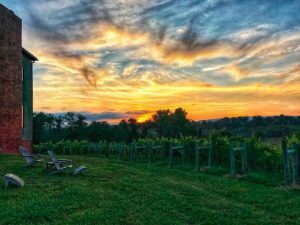 Enjoy award-winning wine and light hors d’oeuvres as the sun sets over spectacular views of grape vines, nearby farms, and the North Fork of the Shenandoah. Arrange a mutually convenient date and time in advance with Muse Vineyards. Certificate expires Oct 14, 2019. Lynne Crumpacker’s work’s are always fondly received at the Fish Fry. 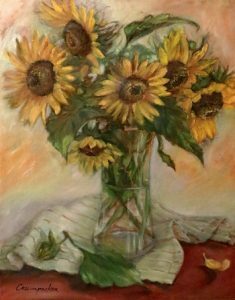 Keep summer’s beauty all year long with Lynne’s wonderful bundle of sunflowers. Oil on canvas, matching handmade frame, 17” x 21”. Est. Value: Priceless! Treat yourself and 11 friends to a special evening, including cocktails and mezza–middle eastern appetizers prepared by chef Diane Gould– at this unique and historic (1897) Woodstock home. The home is on Ox Road with a view of Massanutten Mountain and is said to harbor some friendly spirits—bumps in the night and all—but on the evening of the cocktail party we hope only for the clinking of glasses filled with friendly spirits. Onsite parking is available. 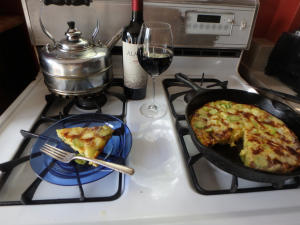 DINNER UNPLUGGED: Bid on this fireside dinner for 8 in Fort Valley! 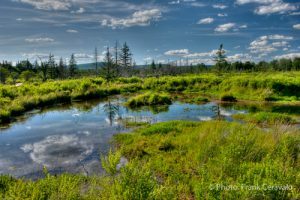 Three-day weekend or weekday stay at a resort cabin in Canaan Valley on a mutually agreeable date. The cozy cabin has one bedroom plus a loft bedroom, a full kitchen and large bathroom with double jacuzzi tub and will accommodate 4-6 people comfortably. Amenities include pristine forests, miles of mountain biking trails, hiking in Dolly Sods, access to tennis, swimming, fishing, canoeing, skiing and weekend entertainment at nearby restaurants and pubs. Have you ever wanted to do something REALLY, REALLY special for your friends? This is the perfect item for fulfilling that wish—a personal performance in your own home by the unique musical group, Sweetgrass. Sweetgrass, an eclectic musical trio from the Shenandoah Valley, will provide music for your wedding, anniversary, birthday or family gathering. They layer and blend unique harmonies and rhythms, using voice, banjo, fiddles, guitar, bass and recorders. Sweetgrass promises a varied and appealing musical experience through original arrangements of Civil War Era, Appalachian, Sacred Harp, Celtic, Middle Eastern and Seasonal music. 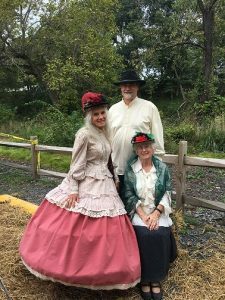 Many of us have been fortunate enough to enjoy Sweetgrass’s music at the Edinburg Old Time Festival, the Shenandoah Valley Music Festival Benefit and Belle Grove Christmas Gatherings. Now is the opportunity to share the experience with your friends with a performance in your own home. Arrange your performance in advance on a mutually agreeable date. Four people will join your guide, John Eckman, Friends Executive Director, to enjoy a day-trip upstream into the mountains to the highest source of water in the North Fork. Along the way we’ll discuss the history and geology of the area and stop at some fun sites like the Fulks Run Grocery (Home of Turner Ham) and Old Hill Cidery to sample local food and drink. 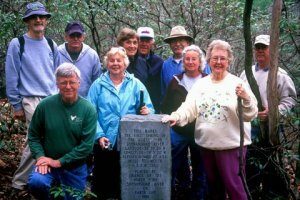 Early in the history of our organization, Friends worked with the US Forest Service to identify the one spring that is the highest in elevation of the many thousands of points where tributaries of the North Fork begin. This “Source of the North Fork” is marked with a monument, high atop Fulk Mountain in northwestern Rockingham County. Head west to the beautiful heart of the Potomac Highlands. Team up with a friend or family member for the adventure of a lifetime! Choose between “The Canopy Tour” and “The Via Ferrata”. The Canopy Tour is the longest and most scenic aerial tour in the region. With 12 zip lines up to 680 ft in length and 80 feet in the air, the Canopy Tour is sure to quench your thirst for fun and adventure. There is no minimum age but minimum weight requirement is 70 lbs, and maximum, 250 lbs. The “Via Ferrata”, or “Iron Pathway”, is a permanently installed system of steel rungs and cables that lets you climb up and over two towering rock fins. On this professionally guided 3.5- to5-hour climb, you will ascend over 1,000 feet and cross a 200’ long suspension bridge. Not for the faint of heart, but well worth the effort. Minimum age is 13. Don’t pass up this three-day weekday or weekend stay at a family retreat on the Patuxent River, near Hollywood, MD. 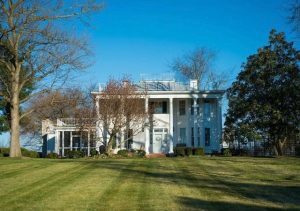 This 4-bedroom house, overlooking the Patuxent, is the perfect place for a family reunion or a getaway with friends. The kitchen is well equipped and the house has direct access to the river. You can swim, launch canoes or kayaks, or simply relax and take in the view. 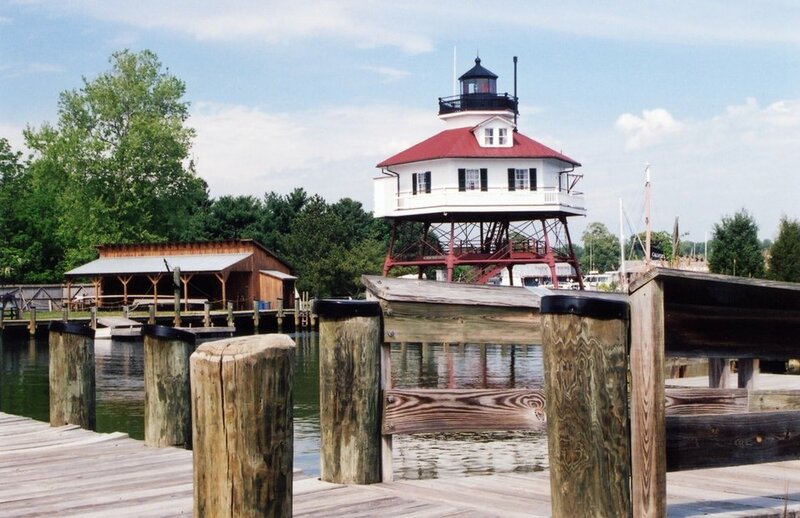 Nearby attractions include Sotterly Plantation, Calvert Cliffs, AnneMarie Sculpture Garden, Calvert Marine Museum, and much, much more. Take advantage of this unique opportunity to explore the Shenandoah River with an incredibly knowledgeable guide! 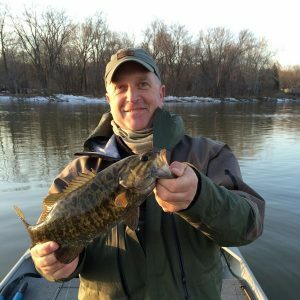 When Shenandoah Riverkeeper, Mark Frondorf, first moved to the DC area to attend grad school, he discovered the Shenandoah, and it was love at first sight. Since then, Mark has guided on the Shenandoah for 20 years, never ceasing to be amazed by its beauty and serenity. You and a guest will join Mark for a remarkable half-day Shenandoah River adventure of your choice. Try your luck casting for the gamest fish that swims—the smallmouth bass–or hit the main stem, roar through Bull Falls, shoot down the Staircase Rapids and explore the history of Harpers Ferry and Virginius Island while comfortably ensconced in the Riverkeeper’s raft. Or, pick a date in the next few weeks and marvel at the fall foliage bursting in color with the whole river practically to yourself. Of course, Mark will prepare a scrumptious picnic lunch, whichever stretch you choose. Trip date to be scheduled well in advance on a mutually agreeable date. Expires Dec 31, 2019. Treat friends or family to an authentic Spanish “Fiesta” with this full meal of Spanish “Tapas”, or small plates, for you and five guests. Party in your home, at the donor’s home in Washington, DC, or at some other location of your choice. 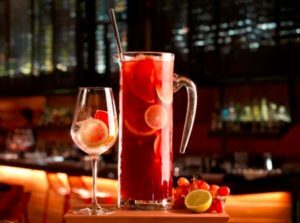 The meal will include wine or sangria, a selection of such Spanish favorites as gazpacho, Spanish ham, manchego cheese, Chorizo sausage, olives, sweet peppers stuffed with goat cheese, a potato and onion Spanish tortilla, beef or chicken skewers, garlic shrimp, braised brussel sprouts, asparagus with lemon aioli, and, of course, a dessert such as caramel custard with whipped cream, fruit and cheese, or rice pudding. Here is your chance to explore the fine art of real metalworking with a successful and experienced instructor. 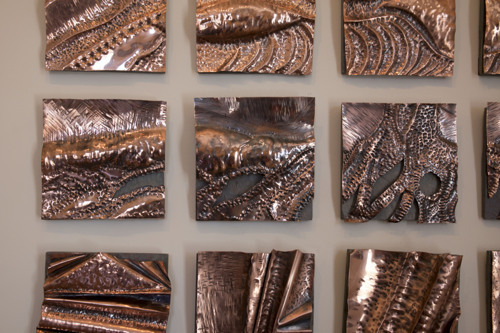 Go beyond simple wire wrapping and beading with a set of five two-hour lessons tailored to your interests in creating beautiful jewelry, sculpture, and/or mixed media projects. Ellen will share her experience with a variety of techniques and materials. You will be working with Ellen at her riverside studio outside of Woodstock. Materials (non-precious metals) and tools are provided for the lessons. Handmade tiles in Sapphire Green glaze framed by tile listellos glazed in Malachite. The panel (15″ x 6″) is mounted on wood, grouted, and signed and dated on the back. Designed and created by Far Ridge Ceramics in Edinburg, Virginia.